Guitarist Alex Machacek, drummer Jeff Sipe, and bassist Neal Fountain played three gigs in North Carolina during the last weekend in June. 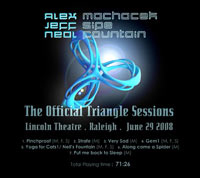 The trio's last show, played on June 29th in Raleigh, is now available as both a digital download and a CD-R purchase from Abstract Logix. See below for the tracklisting and purchase links. NOTE: Matthew Garrison was originally scheduled to place bass for the trio gigs in NC, but had to bow out due to unforeseen circumstances. The final show with Garrison was going to be filmed for a DVD release. That DVD shoot has been postponed. Charlie Hunter, formerly of Concord, Ropeadope and Blue Note Labels, will self-release his next endeavor, Baboon Strength, on Spire Artist Media. The label is a co-venture with his long time manager, Chris Cuevas (Spire Artist Management). 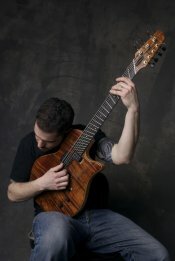 With a career spanning 15 years and a catalog that includes over 17 albums, Charlie Hunter continues to astound audiences with his prodigious and unique ability to play both guitar and bass lines simultaneously. Though he continues this tradition on Baboon Strength, the record is an absolute progression from his previous albums. The music has an electronic feel to it yet the tone is undeniably playful. Due out in mid-September, Baboon Strength will feature Tony Mason on drums, Erik Deutsch on organ, and of course, Charlie Hunter on his custom 7-string Novax guitar. The trio will tour the US and Europe throughout the fall and into 2009 in support of the record. Scott Henderson: Brazil - 7/29/08 "All Blues"
Spotted by Laurie at Truth in Shredding: This is Scott Henderson playing "All Blues" at a workshop in Santo Andre, Brazil on 7/29/08. Great stuff. Here's a short clip of Brett Garsed rehearsing the song "Alien Hip Hop" for his upcoming concert/drum clinic dates in India with drummer Virgil Donati. Exact dates and locations are below.